Soccer is one of those sports where the playing surface dimensions can vary based on skill level and age. 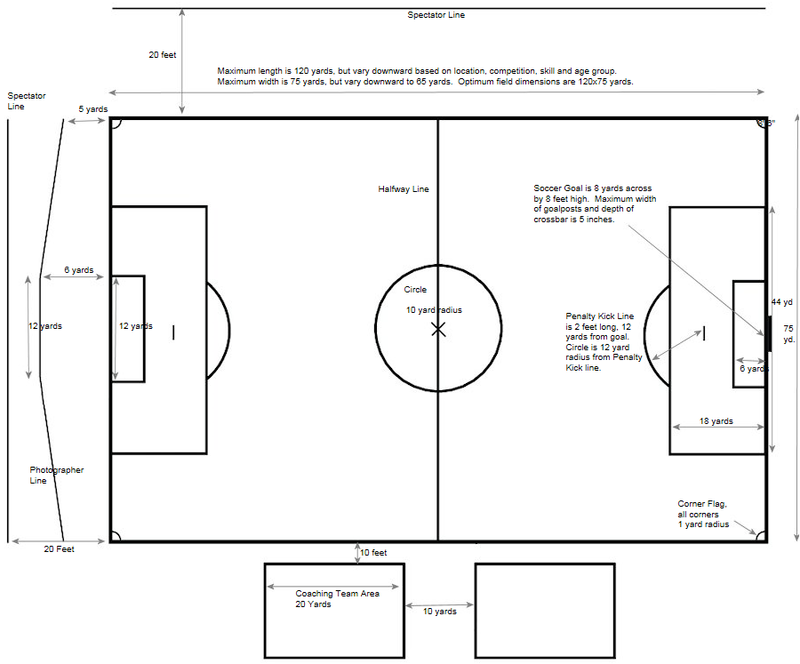 Soccer field dimensions vary in length and width, but do have standard infield measurements. Check out the graphic below for standard soccer field dimensions, or you can check out our Quick Facts About Soccer Field Measurements. Q: What is the length and width of a soccer field? A: It varies, but the optimum width is 75 yards and the optimum length is 120 yards. The widths can vary between 65 and 80 yards while the lengths vary between 110 and 120 yards. Q: How wide is the soccer goal? A: 8 yards or 24 feet. Q: How tall is a soccer goal? Q: What are those corner circles areas called? Q: How tall should a soccer flag be? To Americans, the word "football" means the gridiron sport. To the rest of the globe, though, the word means "soccer." Played in over 200 countries by 250 million players, soccer (or "association football," as it sometimes called) is the most popular sport in the world. According to the Fédération Internationale de Football Association (FIFA), soccer is actually one of the world's oldest sports. The competitive game cuju, in which players could use any body part except their hands to kick or send a ball through an opening into a net, was standardized during the Han Dynasty, which reigned from 206 BC to 220 AD. Rules for the game, which at that time featured two teams of up to 16 players each, were also established during this time period. The Greeks and Romans also developed games similar to modern soccer around the same time period. Soccer's modern rules are based on mid-19th century efforts to standardize the widely varying forms of football played in the public schools of England. The highly influential Cambridge Rules were drawn up at Cambridge University in 1848, but were not universally adopted. The laws of the game are now determined by the International Football Association Board (IFAB), formed in 1886 after a meeting in Manchester of The Football Association, the Scottish Football Association, the Football Association of Wales, and the Irish Football Association. FIFA, soccer's international governing body, was formed in Paris in 1904 and declared that they would adhere to Laws of the Game of the Football Association. The world's oldest football competition is the FA Cup, which was founded by C. W. Alcock and has been contested by English teams since 1872. The major international competition today, though, is the World Cup, which is organized by FIFA. The competition takes place every four years and features as many as 200 national teams in its qualifying tournaments. The finals involves 32 teams competing over a four-week period. There are also professional leagues in Europe and America, and soccer has been an Olympic sport since 1900. In the U.S. alone in 2014, 3,055,148 boys and girls registered to play youth soccer. Combine those numbers with the huge crowds which not only attend soccer matches all over the world but also watch them online, and it is easy to see why the rest of the globe's version of "football" is the reigning most popular sport in the world today.